QUEBEC CITY (CNN) -- The gunmen fired indiscriminately into the crowd of worshipers, witnesses said, even though families were in the mosque. By the end of the rampage, six people died and five others were wounded at the Quebec Islamic Cultural Center. The province's premier, Philippe Couillard, called the attack an act of terror. At least two gunmen dressed in black opened fire at the Quebec Islamic Cultural Center in Quebec City on Sunday, witnesses said. Authorities have not identified the six slain victims, but said they were all men between the ages of 39 and 60. Five wounded victims remained hospitalized Monday, a spokeswoman for Hôpital de l'Enfant-Jésus said. Christine Coulombe, spokeswoman for the National Police of Quebec, said 39 others inside the mosque were not hurt. Two people have been arrested -- one was captured near the mosque and the other was arrested on a nearby highway, police said. 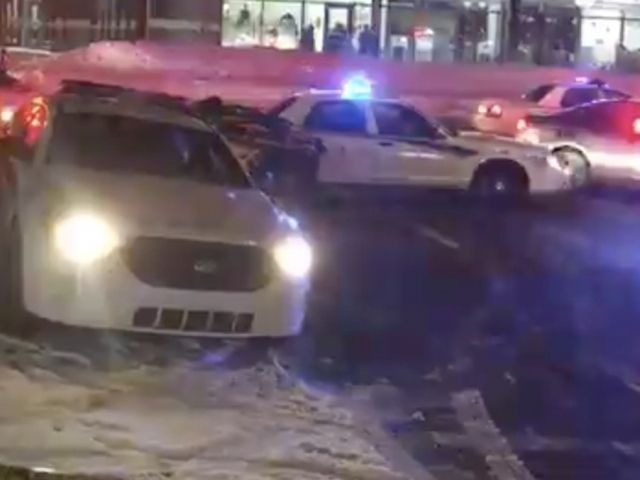 Of the two people arrested Sunday night in connection with the Quebec City mosque attack, only one is now considered a suspect, said Surete de Quebec, the police organization investigating the shooting. The other person who was arrested is now considered a witness and not a suspect, as originally believed, police told CNN. Surete du Quebec has not released the name of the suspect. One attacker called 911 and said he was armed, but was willing to cooperate with police, CBC reported. Authorities have not released the suspects' names nor a possible motive, but police are investigating it as an act of terrorism. Police are also trying to determine whether the assailants had any accomplices. The mosque urged the public to not jump to conclusions or spread unsubstantiated rumors. "Please wait for preliminary results (of the investigation) before circulating rumors," the Quebec Islamic Cultural Center said on Facebook. "The situation is very critical." Another post showed the center's gratitude for the "hundreds of messages of compassion coming from all over." At least two vigils, in Quebec City and in Montreal, are planned for Monday. This is not the first time the mosque has been targeted. "We just learned that a gesture of hate towards our Great Mosque took place Sunday morning (14 Ramadan) around Salat Al-Fajr! Police was made aware and opened an investigation!" Under the Quran, pork is prohibited and pigs are considered unclean. Canada's leaders condemned the attack on social media. Prime Minister Justin Trudeau tweeted his condolences in both French and English. "Canadians grieve for those killed in a cowardly attack on a mosque in Quebec City. My thoughts are with victims & their families." "It is heart-wrenching to see such senseless violence. Diversity is our strength, and religious tolerance is a value that we, as Canadians, hold dear. "Muslim-Canadians are an important part of our national fabric, and these senseless acts have no place in our communities, cities and country. Canadian law enforcement agencies will protect the rights of all Canadians, and will make every effort to apprehend the perpetrators of this act and all acts of intolerance." Premier Couillard said Quebec's support of Muslims will not waver. "Let's unite against violence," the post reads. "We stand in solidarity with the Muslim people of Quebec."